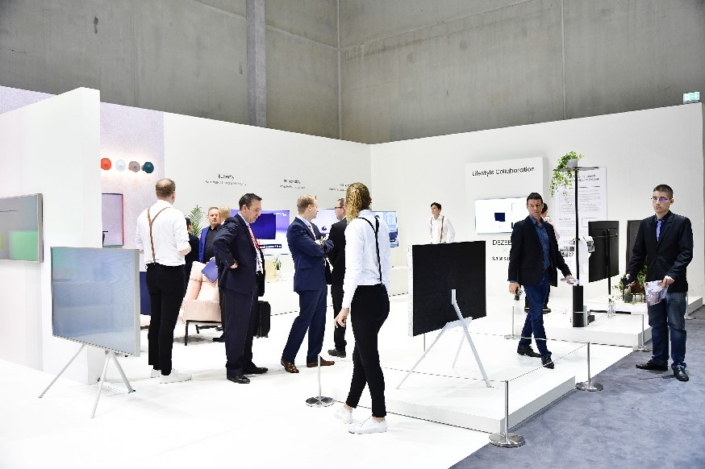 At this year’s IFA exhibition, Samsung is exhibiting an array of lifestyle-focused innovations that make it easy for European consumers to add more convenience to daily life. The household appliances and products featured in Samsung’s booth combine state-of-the-art technologies, which simplify everything from preparing meals to communicating with family, with elegant designs that seamlessly enhance their surroundings’ aesthetics. The result is a lineup of innovations whose performance and versatility are truly reflective of families’ needs. The booth’s Social Kitchen showcases contemporary kitchen suites assembled with the help of acclaimed European kitchen specialists. These include suites designed by Nolte, a premium kitchen brand that has been rated Germany’s most popular for two years running*; Marbodal, a Northern European brand of the Nobia Group that is known for functional and stylish designs; and Veneta Cucine, Italy’s largest kitchen manufacturer, which utilizes premium materials and the latest technologies to create thoroughly modern and beautiful kitchens. The suites have been designed with a focus on performance and luxury, and feature some of Samsung’s latest ovens, cooktops, hoods, dishwashers and refrigerators. Nolte and Marbodal’s suites also feature Samsung’s Family Hub refrigerator, an IoT-connected kitchen control center that allows families to streamline everything from meals and food management, to entertainment and communication. 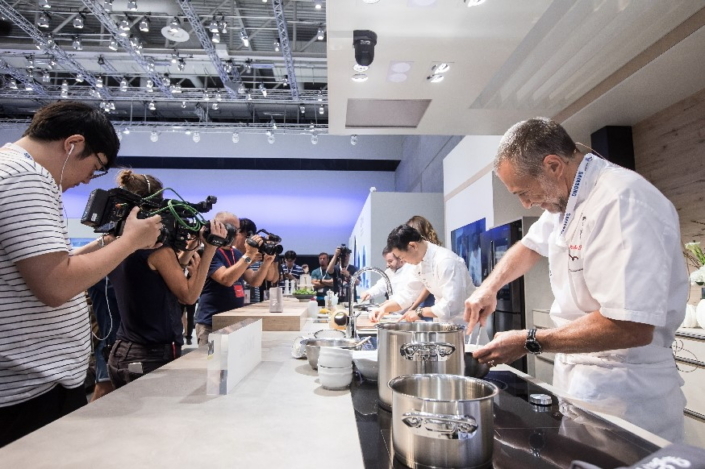 In addition, in a particularly tasty demonstration of Samsung’s appliances’ ability to modernize consumers’ kitchens, early on at IFA 2017, Nolte’s suite served as the setting for a special Club des Chefs cooking show, in which Michelin-starred members of Samsung’s culinary club whipped up world-class cuisine for attendees. The booth’s Lifestyle Zone showcases Samsung innovations that allow families to transform their TV into the centerpiece of their living room. Samsung’s latest lifestyle TV, The Frame, resembles a true work of art. The TV features an elegant frame design as well as a dedicated Art Mode that allows it to display photos and true-to-life renditions of paintings when powered off. 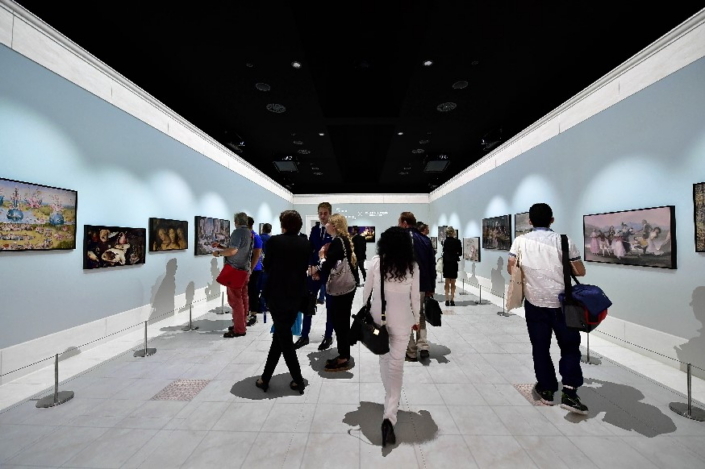 The Frame Gallery showcases the display’s ability to introduce more beauty into consumers’ lives, and invites guests to view impeccable digital depictions of artworks curated from museums around the world, including Spain’s Prado Museum, the U.K.’s Saatchi Gallery, and Germany’s Lumas Gallery. The contents of the gallery span ten categories, and include a total of 100 stunning works from 37 renowned artists – all of which are available for users to access and enjoy via The Frame’s Samsung Collection feature. Samsung also plans to expand the library of artworks available in The Frame’s Art Store from over 450 to over a thousand. By curating a world-class collection, and allowing users to exhibit their own photos and images through the TV’s My Collection feature, Samsung is making it easier for consumers to enhance their homes with exceptional art. The Lifestyle Zone also highlights exciting customizations for Samsung’s latest TVs, including The Frame and QLED TV. 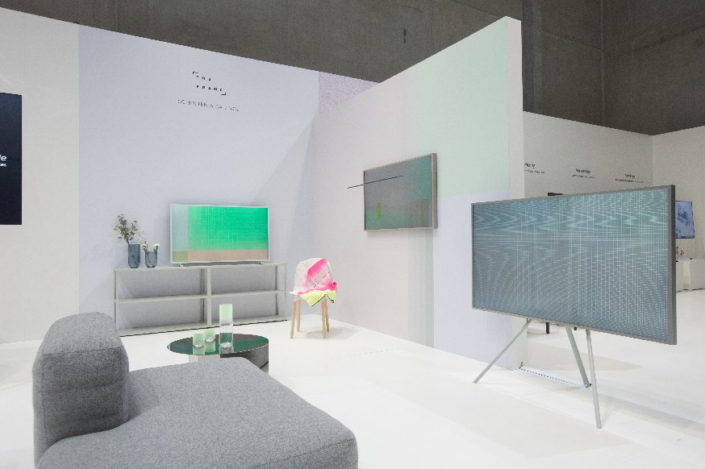 Among them are the five finalists of the QLED TV stand design competition, which Samsung organized with leading design and architectural magazine Dezeen. 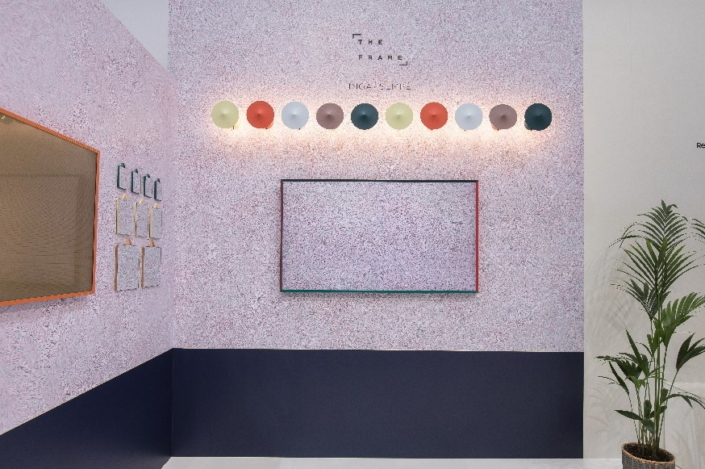 Exhibited to their left are unique customization options for The Frame that have been crafted by acclaimed Dutch design duo Scholten & Baijings, as well as French designer Inga Sempé. The former’s art and bezel design is distinguished by its striking use of minimalist lines. The latter’s is a dynamic and colorful blend of flowing lines that evokes liveliness and movement. Some may liken its aesthetic to a breeze blowing through a field. However, like many works of art, interpretations vary depending on the viewer’s perspective. Check out Samsung’s complete range of lifestyle-focused innovations in the photos below. 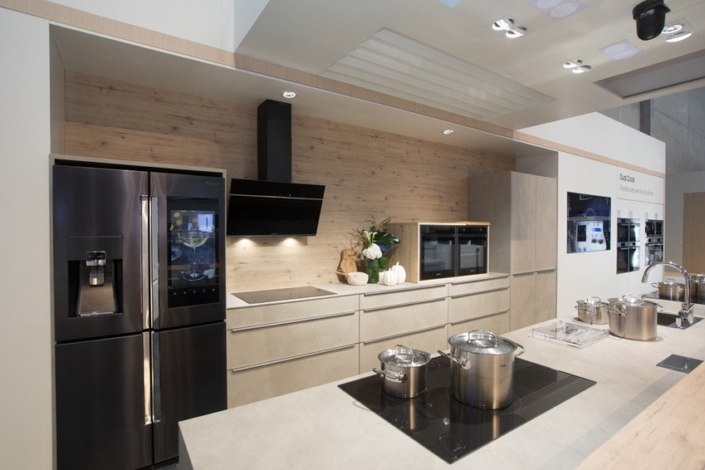 Samsung’s Social Kitchen area showcases contemporary kitchen suites assembled with the help of acclaimed European kitchen specialists such as Nolte, whose design is pictured here. 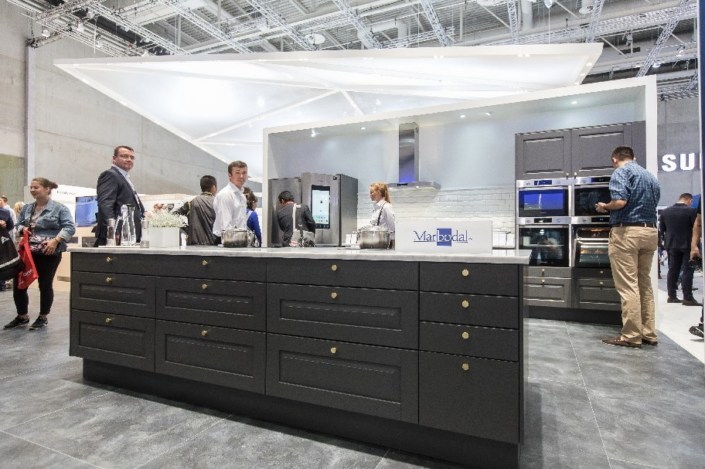 Earlier at IFA, Michelin-starred members of Samsung’s Club des Chefs used Nolte’s suite (pictured here) to whip up world-class cuisine in a special cooking show. Marbodal’s understated suite features a full range of Samsung innovations, including the Family Hub refrigerator. 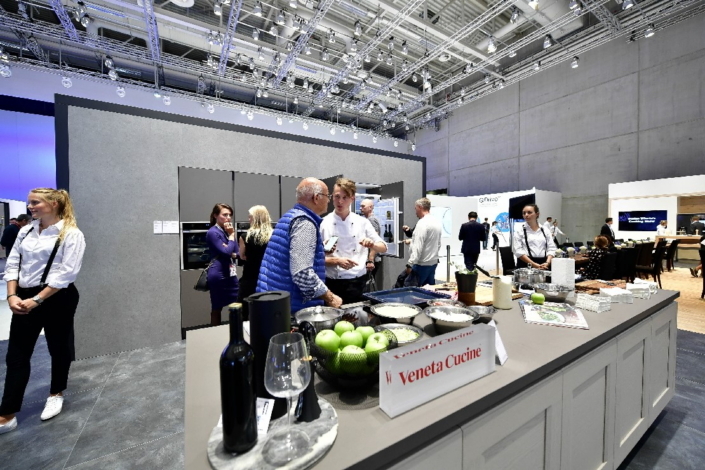 Guests examine the fine craftsmanship exhibited in Veneta Cucine’s kitchen suite. 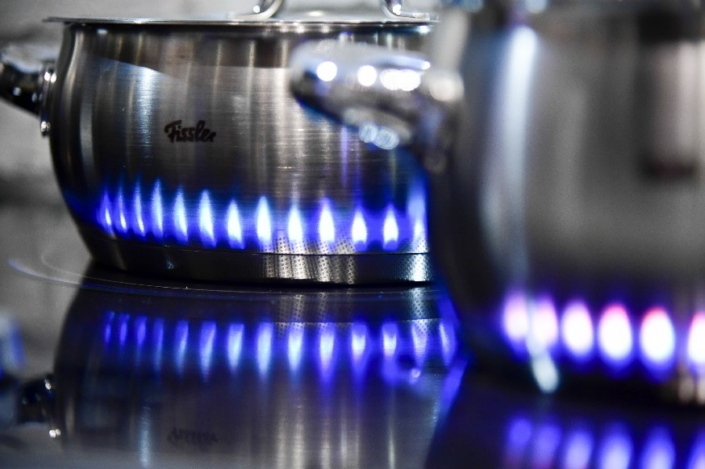 Samsung’s Induction Cooktops project a virtual flame around pots and pans that creates an intuitive way to keep tabs on heat. 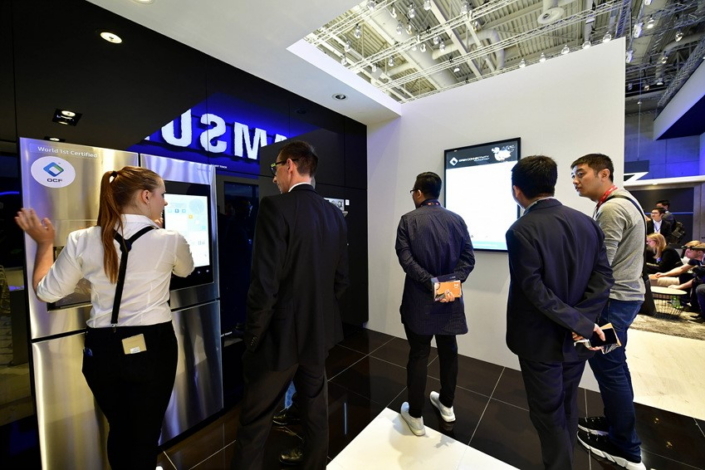 Guests explore the range of convenient features that allow Samsung’s latest Family Hub refrigerators to serve as control centers for modern, connected homes. Samsung’s latest lifestyle TV, The Frame, is available in 43-, 55- and 65-inch models, and features an elegant design and a dedicated Art Mode that allows it to display paintings and photos when powered off. The Frame Gallery invites guests to view impeccable digital depictions of artworks curated from museums around the world, including Spain’s Prado Museum, the U.K.’s Saatchi Gallery, and Germany’s Lumas Gallery. 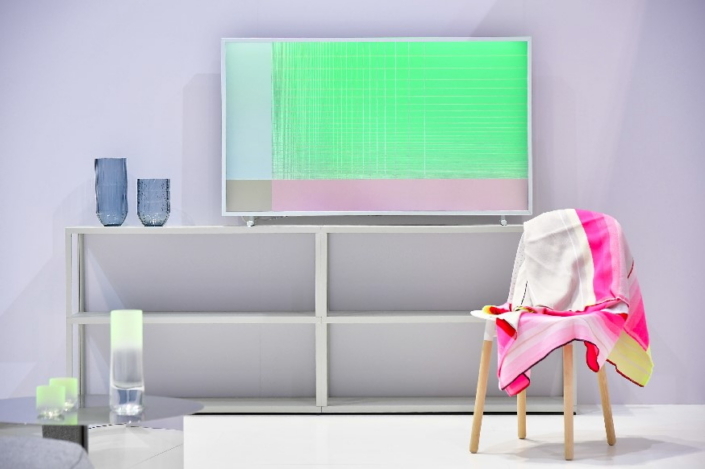 Samsung collaborated with Dutch design duo Scholten & Baijings to present a custom art and bezel aesthetic for The Frame that features colorful, minimalist block and grid patterns. French designer Inga Sempé’s art and bezel design is a colorful blend of flowing lines that evokes movement and liveliness. Guests examine the winning entries from the QLED TV stand design competition. *Based on surveys conducted by the German Institute for Service Quality (DISQ) at the behest of German news channel n-tv.